Jim Kilsdonk - Host and Coach. 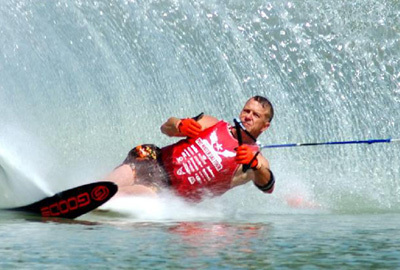 Jim is a 4 time national slalom medalist - with multiple midwest regional and Michigan state slalom championship wins. A former pro tour competitor. Finished 19th on tour list in 2001. 11th place in 2001 Abbotsford tour stop. 13th place in 2001 Malibu Open. Jim has extensive coaching experience, and as a competetive snowskier he brings knowledge of "New School" countering and carving slalom techniques. Certified by Goode USA in setting up/"dialing in" Goode slalom skis. "Jim is a great ski coach and his easy going, eager to please personality make him an outstanding host as well"
Our beautiful friend and expert chef Yolanda prepares all of our gourmet lunches lakeside with slow precision and care. We have over 200 guest testimonials stating that "Yoli's" lunches are the best food that they have ever eaten! We are in the process of creating a cookbook with all of Yoli's secrets. When we ask her what her secret is she says "The difference is that I prepare my food with love!" It's true and it shows!